Our vision is to be one of the world’s largest, best-managed and sustainable pulp and paper companies; the preferred supplier to our customers, and the employer of choice among our people. 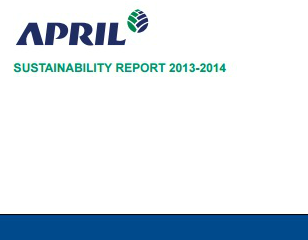 This Sustainability Report follows the latest Global Reporting Initiative standard (GRI G4), and the In Accordance Core option. Material aspects are those considered significant from the company’s perspective as well as that of external stakeholders. APRIL Group is one of the largest, technologically advanced and efficient producers of fiber, pulp and paper products in the world. Our operations are located in Riau province, Sumatra, with corporate offices in Singapore and Jakarta. APRIL Group defines sustainability as managing natural resources to meet environmental, social and economic needs of today’s society without compromising the ability of future generations to meet their needs. Fiber that is processed in our mill comes from legally harvested sources as confirmed by our national and international certifications. Our pulp and paper mill, located at Pangkalan Kerinci in Riau Province Indonesia, is capable of producing up to 2.8 million tonnes of pulp and 850,000 tonnes of paper per year. As an integral component of the communities in which we operate, APRIL Group continually works to promote socio-economic development in the local communities in which we operate. Our mission is to create a working environment in which people are valued, engaged in our core principles and are provided the right conditions in which they can perform at their best.